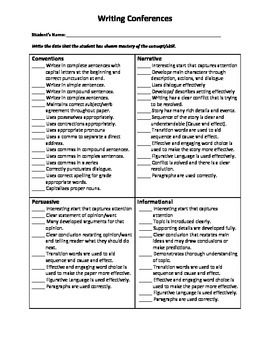 Better document your students' progress in meeting the Common Core writing standards with these two forms. I keep these forms in my students' writing portfolios and use them during every writing conference. The first form is for taking notes during individual writing conferences. It includes space for notes on the current writing piece along with recording what skill you would like for the student to focus on improving in their next piece. This is great for differentiation as each student will be working on a skill necessary to improve their writing! The second form is a skills checklist. It is divided into four sections: conventions, narrative, persuasive, and informational. In each section, there is a list of skills students need to master by the end of the school year. You will then write the date beside the skills when the student has shown mastery. 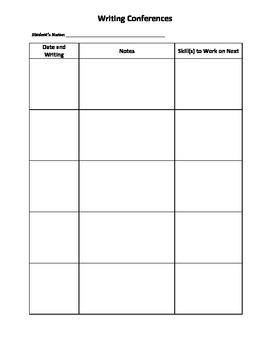 This form also allows you to quickly see what skill your student needs to focus on next. CCSS.ELA-Literacy.W.5.1 Write opinion pieces on topics or texts, supporting a point of view with reasons and information. CCSS.ELA-Literacy.W.5.2 Write informative/explanatory texts to examine a topic and convey ideas and information clearly. CCSS.ELA-Literacy.W.5.3 Write narratives to develop real or imagined experiences or events using effective technique, descriptive details, and clear event sequences. CCSS.ELA-Literacy.W.5.5 With guidance and support from peers and adults, develop and strengthen writing as needed by planning, revising, editing, rewriting, or trying a new approach.